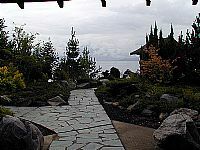 JGarden Description: Small garden located on hill overlooking Arrow Lake, adjacent to the beach/town park. Nakusp was a host community for Japanese interred during the Second World War and this garden was built as a memorial to that event. If passing through Nakusp, be sure not to miss the Nikkei Internment Memorial Center and its garden, located just a few miles away in New Denver.